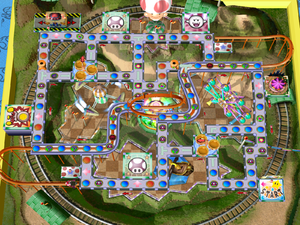 Toad's Midway Madness is an amusement park board hosted by Toad in Mario Party 4. He built it because he loves amusement parks and wanted his friends to have fun in it. Here, Toads are everywhere, and are put in charge of the games and shops (the one hosting wears stripe pants and a bow tie). Artwork from the board selection screen. The main attractions here are the roller coaster and the tea cup rides. Players are allowed to go across the coaster tracks, but stepping on the Happening Spaces on the tracks causes the rocket kart to chase them down to the left or right sides of the board (depending on where the kart is at the time). Players can also ride the roller coaster for five coins to the other side. Riding the roller coaster gives the player a chance to get some coins on the way, and chase down other players on the tracks. The tea cup rides are the main way of getting around. Every time a player goes on them, they are taken to the direction that the arrow was pointing, then the direction changes. Changing the direction is also caused by landing on the Happening Space near the ride. The Item Minigame of the board, the Merry-Go-Game, involves a merry-go-round. Players have to stop their horse they are riding on, then wait for the pictures of the 4 items to stop. The player wins the item whose picture is facing them. The Coin Minigame, the Space Rocket Game, involves a rocket ship ride. Players pick one of three rocket ships, which takes them to one of the coin amounts at the top. They players get the amount of coins that they land on. In Story Mode, if players beat their opponents on the board, Toad challenges them to a minigame called Bowser Bop in order to win his present. In the background of this board, Steamer can be seen circling the entire board that will show up from time to time depending on where the characters are and where Steamer is. Toad introducing players to the board. One of the locations of the stars on the board. The happening space that sets the roller coaster off. A board feature: the tea cup rides. Spanish Toadaventura Literal parody name of PortAventura, in Spain. French Toad Aventura Parc Literal parody name of PortAventura, in Spain. This page was last edited on January 30, 2019, at 20:43.